3 bedrooms / 3 bathrooms, sleeps 7 comfortably. Vacation in style with our wonderful townhome in the highly sought after resort of Windsor Hills. 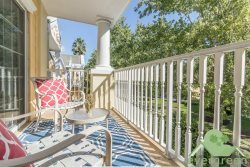 We have a great selection of privately owned condos and townhouses available here, each designed with your vacation enjoyment in mind, and 'Disney Rebel Retreat' is very possibly the most popular unit we have. Competitively priced for the quality of home on offer, this beautiful townhome offers fantastic value for money providing, as it does, tremendous resort style amenities, in a secure gated community, along with a host of in-house features.. The home you see here is 'Disney Rebel Retreat' and it is a 3 bedroom / 3 bathroom townhome. It is located very close to all the facilities Windsor Hills provides, about a one minute walk from the clubhouse area and as you would expect, this very popular townhome also comes extremely well equipped. Disney Rebel Retreat sleeps 7 people comfortably. The bedrooms consist of 1 King size bedroom, 1 Queen size, and a third bedroom that has a set of bunk beds and a separate twin size bed. All of the bedrooms have large flat screen TV's in them, but most important of all, they each have an en-suite bathroom. This is a great feature of Windsor Hills townhomes and is possibly why they are such of a favorite of our guests. Note too, that the Queen bedroom is on the first floor, something which might come in handy for those traveling with guests who may find stairs hard to negotiate. It also has a 32" flat screen TV. The Master bedroom is on the second floor and as of June 2018 also has brand new furniture, and a wall mounted 50" flat screen TV for your enjoyment. The STAR WARS room, also on this floor, can also boast brand new furniture, including a set of bunk beds, and a separate twin bed. The excellent wall murals have transformed this room and it really has become a firm favorite of our guests, and is likely to remain so. The feedback we have received has been extremely positive and with the Playstation in this room, viewed on another 50" wall mounted TV, the kids understandably love it have a wonderful time in here. Disney Rebel Retreat also has a compact kitchen, spacious living room and dining area, and a laundry room with a full size washer and dryer. The main living area features a wall mounted 65 inch flat screen television, and all new furniture as of June 2018, and has also been re-tiled in the living area, kitchen and bathroom. The kitchen is fully equipped as you would expect with a dishwasher, microwave, full refrigerator, stove, coffee machine, toaster, blender and waste disposal, and all the hand held appliances you could use. All towels and linens are provided for your stay in all our homes too, with kitchen utensils and crockery provided as well. A patio door from the living area leads onto a private patio, featuring a 12' square splashpool, perfect for families of all size and ages, and another great feature of this wonderful home. Pictures of the Windsor Hills resort are mixed in with those of Disney Rebel Retreat just to emphasize the real quality this community offers. As a company we are active in only the very best resorts, and Windsor Hills is number one for a reason, with this home typical of not only the quality of homes we offer, but the standards that we look to maintain. We hope you like Disney Rebel Retreat, thank you for viewing, and look forward to welcoming you on your next vacation!.